Great vintage pics from The Birthday Party’s live show in Athens, 1982!! Thank you, Jonathan, for publishing an expanded account of that night. Marvelous to read your comparison of Nick’s performance of 30 years ago with Grinderman at Coachella. Folks, I don’t have the Mainstreet show but I do have the bootleg audio from two nights later, May 5, 1983, when the band played Palmerston. Here’s an audio fix celebrating the 30th anniversary of The Birthday Party’s NZ tour. Enjoy! DEC. 7, 2014: THE LINKS FOR BOOTLEG ARE NO LONGER AVAILABLE. “Killer Instinct” interview by Andrea Cangioli (1996) is under the page break. When I heard Mick Harvey was touring in support of his album Sketches From the Book of the Dead, I decided immediately to set off to Malmö, Sweden . . . . I spoke to Mick about his ongoing series of European tour dates (full details of which are available at http://mickharvey.com ), plans for his next album, and also topics relating to his past involvement with The Birthday Party and Nick Cave and The Bad Seeds. Great interview, Rory. I enjoyed reading about Mick’s current tour with Rosie Westbrook and J.P. Shilo, his thoughts about songwriting, his reminiscences about Rowland S. Howard, the revelations about Tracey Pew’s death and The Birthday Party, and of course, Mick’s thoughts about his ‘invisible’ role as manager for the Bad Seeds and the stress of that situation. 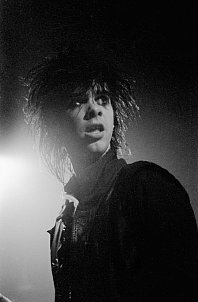 Nick Cave, February 19, 1982 issue of RAM. Photo by Tasso Taraboulsi. Thanks to chronicfabulist for the original scan!